Our last post was on the penetration of e-commerce and the proportion of retail sales contributed by e-commerce , across 5 countries. After reading it, one of our loyal readers asked us for some more information about e-commerce in India. Hence, this time we’re looking at the total value of e-commerce sales contributed by various categories of purchase / transaction. In India, the total value of e-commerce transactions was a whopping Rs. 125, 732 cr in 2015, and it grew at 28% CAGR between 2012-15. 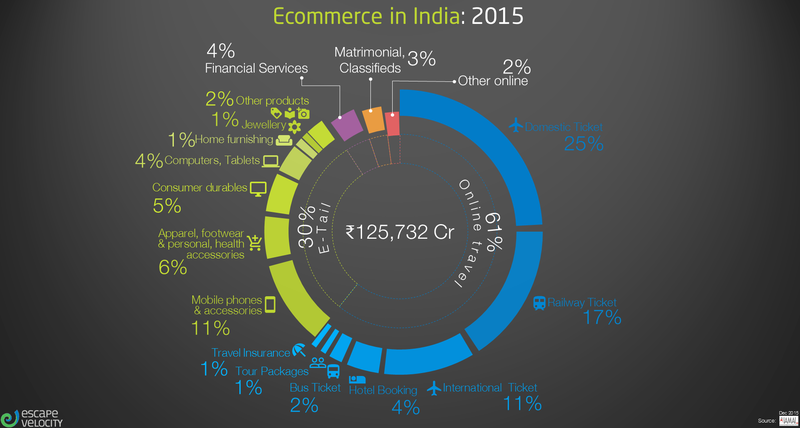 That online travel drives a bulk of e-commerce revenue in India is a fact that anyone who reads a newspaper is aware of ; this chart adds the details – 61% of the total e-commerce revenue of Rs. 1.25 lakh crore was driven by online travel. Of this, domestic air tickets are the largest chunk, followed by railway tickets, and then international air tickets. What we typically call e-commerce and should more accurately be termed e-tailing – i.e. the purchase of various types of products online – is actually just 30% of the total value of e-commerce transactions. The 3 categories within ‘e-tailing’ that are driving the growth are ‘Mobiles phones’ (126% CAGR),’consumer durables’ (135% CAGR) and ‘home furnishings’ (94% CAGR). The ‘Food delivery’ segment , albeit relatively small at just 1.4% of total e-commerce, also grew by leaps and bounds with an 89% CAGR from ’12 to ‘15. 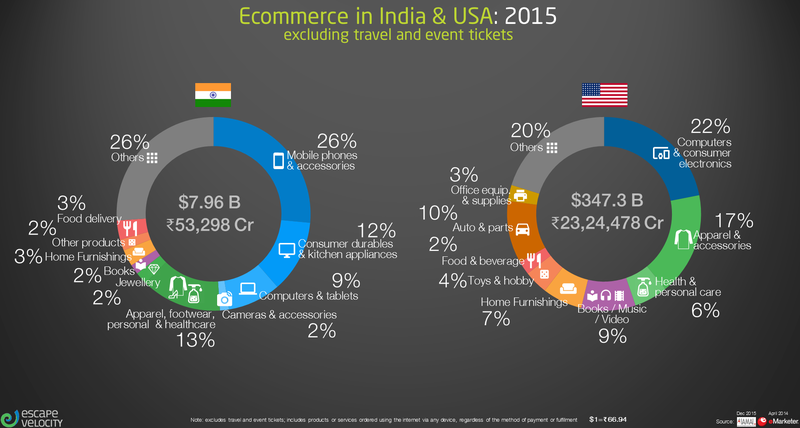 In e-tailing in India, there is an over-dependence on ‘computers, durables and consumer electronics’ as compared to the U.S. – almost 50% of total e-tailing in India vs. 22% in U.S.
Interestingly, ‘Auto and components’ is something that hasn’t taken off in e-commerce in India at all, while in the U.S. it is 10% of e-commerce by value. The Indian online car market is limited to ‘second hand cars’ which is mostly a ‘classifieds’ business. 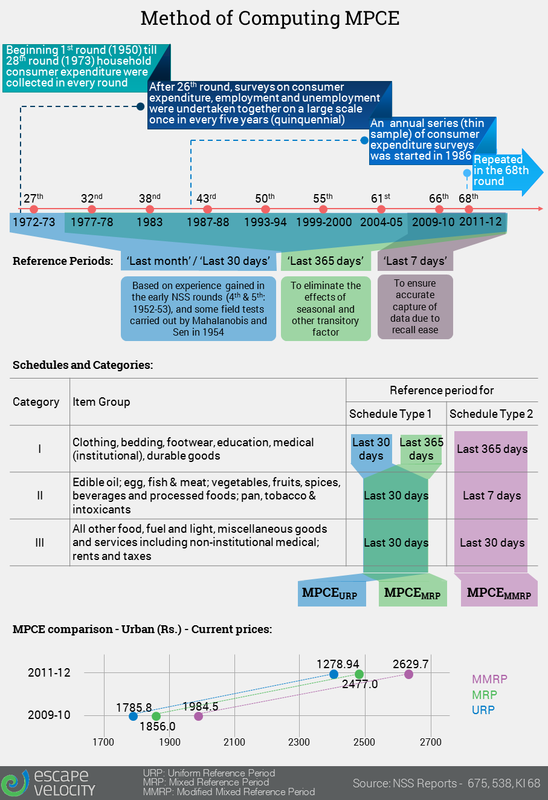 We’d earlier shared a set of infographics on per capita expenditure on various categories in urban India (https://escape-velocity-blog.com/2015/08/19/infographic-india-expenditure-data-urban/ ), and the trends over time therein (https://escape-velocity-blog.com/2015/09/22/infographic-india-expenditure-trend-urban/ ). 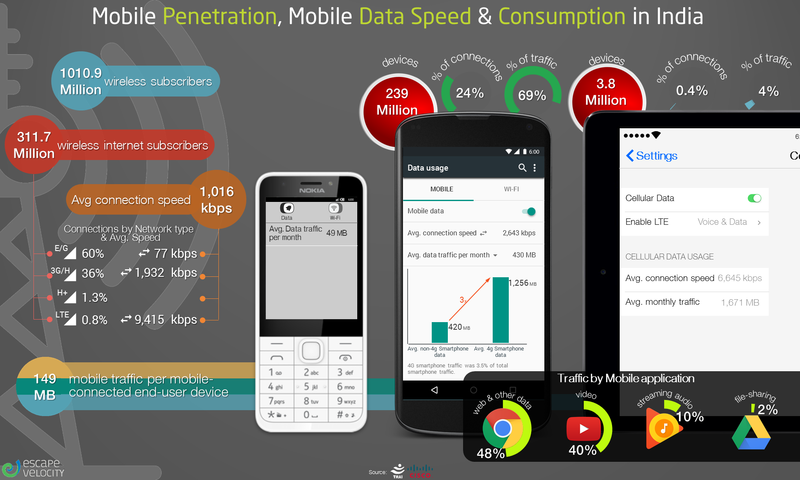 This post shares similar data for rural India. The first point to note is that the average MPCE (monthly per capita expenditure) is much lower for rural India vs. that for urban India (Rs. 1429.96 vs. Rs. 2629.6 respectively). 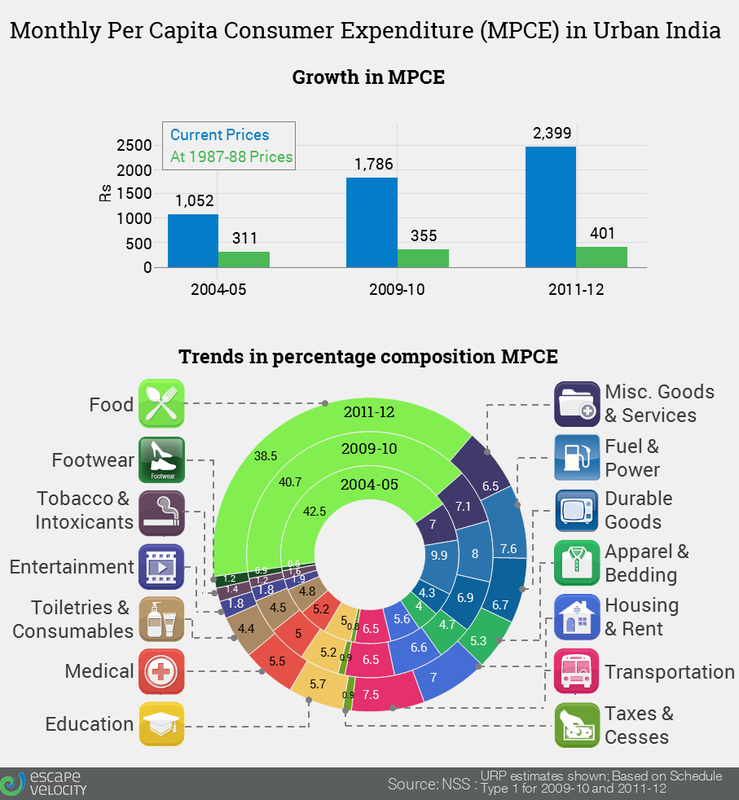 Hence, while the absolute value of expenditure on various categories may be lower in rural India, as a percentage of the MPCE it’s much higher. For instance, though the average monthly spend on food is Rs. 622 per capita, it is 48.6% of the total per capita expenditure ; this is closer to the proportion spent by the poorer fractiles of the population in urban India. One area on which folk in rural India spend much less than their counterparts in urban areas is housing, others are education and transportation. In almost every other category, the proportional spends (spending on category as a % of average MPCE) of rural folk are actually higher than those from urban areas. Read this article about the English Dost app via a friend’s Facebook feed and was reminded of a few incidents that I’ve witnessed during the last year. On the day a friend left Mumbai for Singapore, among those who visited her house to say goodbye was her maid. The maid had brought her adolescent children along too, and I was amazed at the difference between the maid and her children. Had the mother not introduced me to her daughter, I’d never have guessed how closely they were related; the maid seemed like someone one step away from the ancestral village, while the daughter seemed a native of a big city. While the mother wears a sari, cannot speak much English and is rather diffident, her daughter prefers jeans and a shirt, speaks good English and is much more confident. While the mother is uneducated, she’s ensured that her daughter got a school education and learnt English, and encourages her to attend college; even though the young girl has to hold down a part-time job in order to meet her education expenses at college ,she’s determined to obtain a college degree that will get her a better job than her mother’s and a brighter future. A few months later, I was at Bodh Gaya for the sales and marketing module of a Cream training program. The participants comprised micro-entrepreneurs from villages in Gaya and Muzzaffarpur district of Bihar. They could speak some English, but not much ; hence classroom sessions were conducted in both English and Hindi, with constant translation of any English sentence by an interpreter. All our training material (slides , hand-outs, question papers) had also been translated into Hindi for the benefit of the participants. Yet we witnessed an amazing zeal to learn new English words that pertained to their businesses, as if they saw these words as currency for garnering status in the eyes of their peers (remember that these were all rural micro-entrep[reneurs). There were participants who’d stop us mid-sentence and ask us to spell out ‘negotiation’, ‘consumer’ etc. and earnestly write down the English word in their notebooks. No wonder there’s such a huge market for English learning apps and so many of them available now. There’re generic apps like Busuu through which anyone can learn English ( or another of a set of languages) by having conversations with native speakers of that language. There’re English Dost and enguru, both of which use a game with real-life situations to help users learn English, these seem to target those joining the corporate sector in junior management roles. English Seekho by IMImobile and IL&FS Education & Technology Services limited target a very different audience – junior level clerks, traders, unskilled laborers, frontline staff, taxi drivers, restaurant waiters etc. There’s also the British Council site that has several English learning apps, podcasts etc., and even an app to help Taxi drivers learn English to communicate better with their customers ! Clearly there’s a ton of demand from a large number of segments. This post is just a follow-up to the previous post – fulfilling my promise of illustrating how the MPCE is calculated. Broadly, the endeavor has been to get more accurate data and time periods have been appropriately chosen / designed to capture certain data. The household consumer expenditure schedule used for the survey captures both information on quantity and value of household consumption. Info collected consists of 142 items of food, 15 items of energy (fuel, light and household appliances), 28 items of clothing, bedding and footwear, 19 items of educational and medical expenses, 51 items of durable goods, and 89 other items. Whew ! That’s a lot, isn’t it ? Within foods, except for Milk, fruits & Beverages, all other products categories tracked have fallen in contribution. Among the rest of expenditure, durable & minor durable type goods has seen the highest jump of 2.4pp followed by rent at 1.4pp and clothing & bedding at 1.3. The method of computing MPCE is rather interesting ; next week we’ll share an infographic on that too. This infographic kicks off a set of posts that will delve into various aspects of income and expenditure distribution in India. 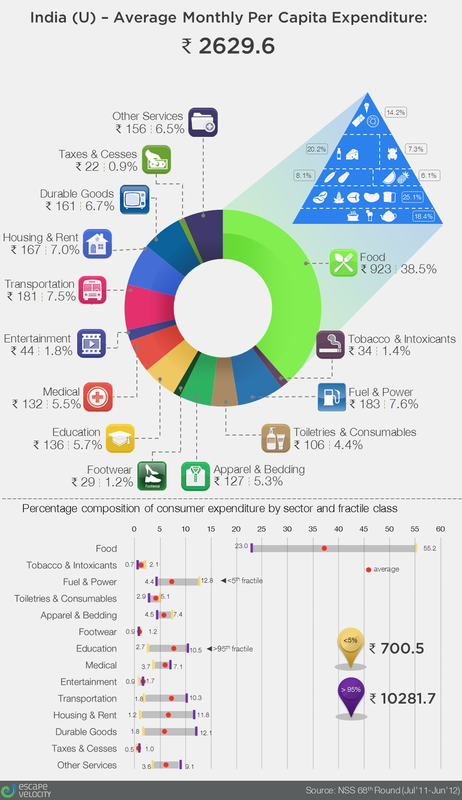 This one describes the proportion of expenditure spent on various categories. The pie chart on top shows how the average monthly expenditure per capita gets divided over several categories. But, as we all know, averages can be misleading. Hence the line chart below that shows how the percentages vary for different fractiles of the population. The pie-chart clearly shows that food is the single largest component of the average expenditure basket, at 38.5% of the total average monthly expense per capita. What is even more interesting to see is how the proportion of expenditure on food varies with income, this is explored in the line chart (with expenditure fractiles being the proxy for income). The poorest 5% have a per capita monthly expenditure of Rs. 700.5; for this segment, expenditure on food is over half their total monthly expenditure. The richest 5% , on the other hand, spend only 23% of their monthly expenditure on food. A similar trend can be seen in a few other categories, one of them being fuel and power. While on an average, the spend on these is 7.6% of total expenditure, it comprises almost 13% of the monthly expenditure of the poorest. As a proportion of their total expenditure, they spend more for electricity or cooking fuel than the richest do. Many other nuggets buried within this infographic, but I’ll leave it to you to discover those ; we’ll be back soon to explore another facet of income and expenditure distribution.